Today’s tags are SUPER simple – remember I promised easy? These have the tiniest bit of white coloring with a white pen – the rest is quick diecutting! Watch the video below or click HERE to see it in HD on YouTube. Bible Craft today: Scripture Boxes! All week I’m offering up tutorials on my other channel – these are also pretty boxes for all kinds of treasures, but especially encouraging Scripture verses. Watch the video below or click HERE to see it on YouTube. Daniel Smith Watercolor Grounds, Gold 4 oz. Those bears are adorable! These tags are inspiring… any idiot like me could do them! TFS. Another cute one!!! I love that you have included an “I can do that” project. The white touches make it special, and wouldn’t have thought to do it over an unmasked image. Stamps on kraft cardstock, too cute! So cute, really like the bow die, have to add to wish list! Fun fun fun! I am enjoying seeing all of the different types of tags! Thank you! So cute and adorable, I love the white and kraft combination, and the pretty bow, I am going to case this sometime soon, thanks for the inspiration! I love these! You are so creative. I wish you did 48 tags. so simple and so lovely. great creativiness. Cute, cute! Love the bears! TFS! Gotta love the Kraft and white….everything looks so neat when done like this. Simple is a good thing! Love the simplicity of these tags! I love how easy these tags are to make and they are gorgeous! Thanks for sharing. I have got to try coloring on browns- the white just pops! Very cute! I like the added dots of white for the eyes! Those bears are adorable. I love the tags. I’m always drawn to simple images like this with just a pop of white on kraft paper! Love them! I have been using more brown card stock for about a year now. I like how it gives just a little extra punch to things. Thanks for sharing. the quick and easy tags. 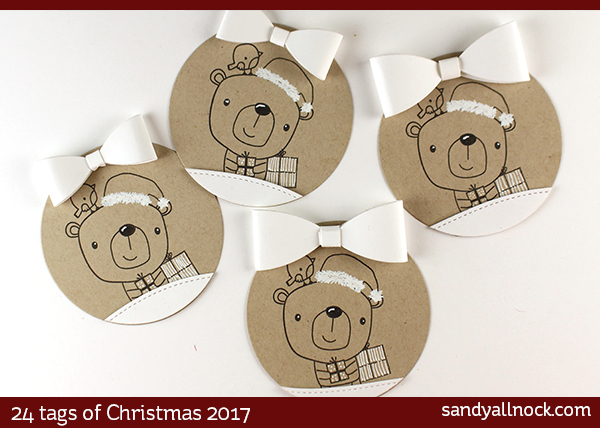 My mom has always been a fan of kraft color paper at Christmas she would adore these! So easy but so adorable!! I absolutely adore those! Love the clean and simple look of these. Once again, these bear tags are awesome! You are doing a great job at showing us how to do or copy somewhat tags makes great gifts. Thanks for sharing. Those bears are adorable and fun! Just goes to show that awesome projects do not have to take hours. Sandy, your tags are adorable and I love the gift idea of making a beautiful box of scripture verses. Tag. something I want to make.TFS! Now that is easy enough for me to do. Thanks. What a gorgeous tags, love it that the are simple to make and looks like a lot of work!